» How Much Can You Make as a Travel Blogger? It seems like a far-fetched dream – getting paid for traveling? Watching travel shows on TV I often wondered how the heck those people got so lucky that they don’t have to sit under fluorescent light all day, 5 days a week. But thanks to the popularity of blogs, getting paid for traveling actually is an attainable dream. Travel blogs started taking off years ago. Many veterans of travel blogging started in 2006-2008. So one might wonder if it’s too late to become a travel blogger since it’s a saturated space. But what I’ve found from my research is that there are plenty of travel bloggers who started in the last year or two. And in fact, thanks to varied social marketing platforms such as Pinterest, travel bloggers who are savvy with their social media strategies are able to herd visitors to their site no matter how late in the game they entered. The audience is ever-evolving, which means there will always be an audience. Now, the question is: How much can you make as a travel blogger? Is travel blogging actually profitable enough to sustain a lifestyle? It’s a crazy thought to quit your job and rely on the cloud to bring in income while you are relaxing on the beach in Chile or wading through a forest in Cambodia. But to answer this question, I collected data from 7 travel bloggers who currently publish or have published income reports recently, and went to work analyzing the data. It’s worth mentioning that the first thing I noticed while looking through multiple travel blogs is that there are 2 distinct types of travel bloggers: ones who live abroad (i.e. 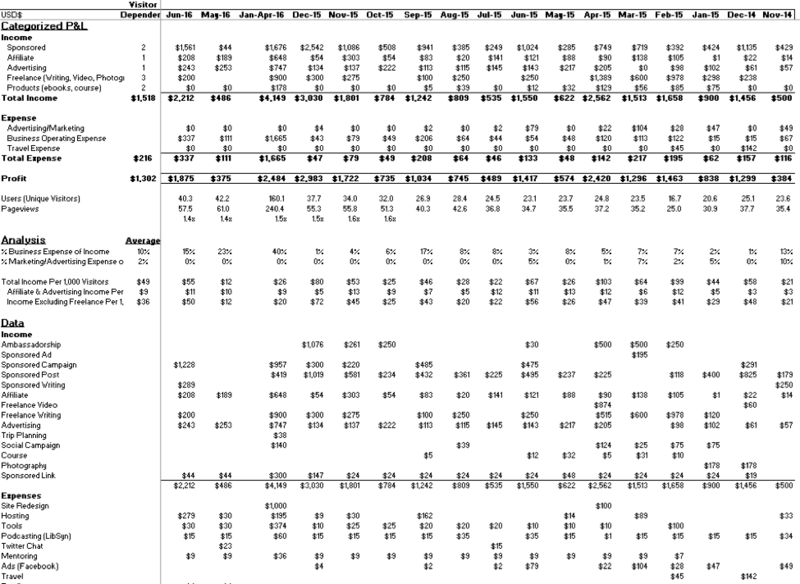 travel long-term) and ones who take trips (be it a week at a time or 2-3 weeks). This gives me great hope that anyone can start travel blogging part-time while they have a full-time day job and eventually can turn travel blogging into full-time if they wish. Here’s what I found on how much you can make from travel blogging. First, let me lay out the foundation. This is data and analysis for just ONE of the travel blogs. See below for source. Travelblogbreakthrough.com (Denoted as “TBBT” wherever mentioned below) – A former management consultant who has an engineering background, originally from Toronto, Canada. Thought of the idea to quit and travel back in Dec 2011. After half a year of planning, concept turned into reality in May 2012. Thewanderinggourmand.com (“TWG”) – A stay-at-home dad who started the travel blog part-time in 2009 and finally quit his day job to dedicate to the blog full-time in 2014. His unique niche is craft beer and food blogging while on travel. Wanderluststorytellers.com.au (“WLST”) – A family of 5 from Australia. Family-friendly travel blogging. They are relatively new – started travel blogging part-time in June 2015 and turned it into full-time in February 2016. In a year and a half, they’ve built a loyal base of viewership to 14k – 25k unique visitors per month. Their strategy is Pinterest and Instagram, with more than 12k followers on Instagram. Livingthedreamrtw.com (“LTD”) – A couple who started travel blogging back in 2010. They now have a team of 4 including themselves. They’ve leveraged their blog into selling trip planning services. Wheressharon.com (“WS”) – Perhaps one of my favorites. It’s a one-woman show on her blog (actually, a portfolio of blogs), but travels include her husband and kids. Started full-time travel blogging in October 2013. She is incredible – systematically grew her visitors to the website with a healthy growth month over month since October 2013, and her income is solely focused on truly passive income – affiliates and commission. Freshoffthegrid.com (“FOG”) – Also a pretty new travel blog – started in August 2015. This couple carved out a very niche segment of travel blogging. They do road trips and camping in the US. They blog about camping food and do collaborations on camping food recipes. Nerdynomad.com (“NN”) – A long-time travel blogger. Not too much data on income reports, but wanted to point this blog out because of her unique product that’s done very well in sales – a physical customized map of the city she traveled extensively. The risk with making travel blogging your livelihood is not at the start of the new lifestyle/business venture but in the midst of it. That is, the upfront cost is very minimal, as basically, you can have a website running for $100 and you’re off to the races. Typically, depending on the size of the blog (i.e. how many visitors the site gets), the average monthly income generated by travel blogs is between $1,000 – $4,000. Once the blog has a sizeable visitor traffic, the travel bloggers can also receive sponsored trips whereby they can travel for free, which can typically be valued between $2,000 – $4,000. Hypothetically, if you hustle and are able to get a sponsored trip every month, you can be traveling for free and generate $2,000 a month from the blog. Because business expense is so low, travel blogging can definitely be a profitable business venture or a way to live. HOWEVER, travel blogging is NOT as passive as you might think. If you think “set it and forget it” mentality is going to work, then you can forget it altogether. From my research and analysis, I found that the passive portion of the income is quite low. So then, which income stream does pays the most for a travel blog? Interestingly, what I found was that income earned through passive means is unfortunately not very high in most cases. Affiliate income averaged around 9-10% of total income, earning on average $10 for every 1,000 visitors. Which means that if you were consistently getting 50,000 visitors every month, affiliate income would draw in $500 a month. One exception is wheressharon. Affiliate income made up ~60% of total income and for every 1,000 visitors, she earned 6.0x the amount compared to other travel blogs. Her biggest source of affiliate income came in the form of commissions. What she does well is she has commission/affiliate based sources that focus on bigger ticket items when traveling. For example, her commissions are from Hotelscombined.com, Booking.com, Agoda.com, and Airbnb.com. In certain months, you can make as little as ~$300 and then jump to $2,300 the next month when you get a bunch of work (as in the case of FOG). Income from products can have a double benefit – you not only leverage your travel blog’s audience to sell your products, you can also use it as a lead magnet to attract visitors to your website. It is the most interesting source of income to me, because you can be as creative as you want in creating a product that aligns with your travel blog. Ebooks are the most prominent for travel blogs. Online courses can be found as well. Trip planning services are also hugely popular as a product offered on travel blogs. One of the most unique products I’ve seen is NN’s customized physical map of Kigali, Rwanda. It has illustrations and tips, and one of the more successful months brought in $5,337 just from sales of the map! Another product where it pays off being in a niche space is FOG’s recipe collaborations. Their travel blog niche is camping. So, they often engage with other sites or magazines to come up with camping food recipes, which I think is so creative and effective in leveraging your skillset. If you’re lucky or if you’re an authority in your field, companies will approach you to be a sponsor of your travel blog. But most often than not, you have to be the one hustling to get sponsorship. You do need to have built a sizeable web traffic to your travel blog to secure sponsorships. But, I was pleased to see that you don’t need that much traffic to start rolling in the dough. A. TWG has less than 7,000 monthly unique visitors and still secured sponsorship of an average $260 a month. WLST had 14,500 monthly unique visitors and secured $660 on average. B. Although FOG doesn’t report the number of visitors to their site, they’ve only been around for a year and a half, they started around the same time as WLST, so more likely than not, their unique visitors are between 7,000 – 15,000, and they were able to secure ~$300 on average in sponsorship income. C. With 14,500 unique visitors, WLST got $1,000 – $2,500 worth of free sponsored trips. D. WS got $4,000 worth of free sponsored trips when they had 35,000 visitors. So, we could summarize that by saying sponsors will partner with travel blogs that have as low as 7,000 monthly unique visitors. And you could potentially make $4,000 in value from sponsors when you have 30,000 monthly unique visitors. Oh, and a worthy mention is that for the travel blogs that reported both unique visitors and pageviews, the relationship between these two site statistics were very similar. It was 1.5x pageview for ever 1.0 unique visitor. HOW LONG DOES IT TAKE TO START EARNING INCOME ON A TRAVEL BLOG? You’ve seen from real examples of travel blogs that you can make a living as a travel blogger. It is possible to quit your day job that you feel stuck in and get paid to travel. It takes work as with anything else, but as illustrated above, there are many ways to get creative in earning income and to me, that’s the appeal of becoming a full-time travel blogger – there is no limit as to how much you can make. It really depends on how much traffic you get on your website and how much you hustle to get sponsored income or make products to sell to your audience. We’ve seen that you can make a sizeable income just from 7,000 monthly visitors to your website. As in our example travel blogs, WLST and FOG are making $2,000 – $4,000 a month (including non-cash value) in just a year and a half since launch. But it must be noted that WLST spent an average of almost 50% of income in advertising/marketing expense to promote the blog. On one hand, this might come as a shock. That is a huge chunk of the income that you won’t see. On the flip side, it is evidence that advertising/social marketing is an effective tool to grow your audience to the level where you can make a significant amount of money on your travel blog. Now that you’ve read how much you can make from travel blogging, are you ready to take the plunge? Or do you feel that it is not enough money for you? Well, if you’re more convinced than ever that you want to finally quit and live a nomadic life as a travel blogger, these are strategies that you can employ to grow your travel blog as fast as possible once you have it up and running. Have a unique position – e.g. outdoor camping travel, healthy eating while on travel, Mexican restaurants across the US travel, etc. Thank you for getting this far! It was a long post but I hope it was worth it. If you are already a travel blogger, I would love to hear your thoughts about how the above applies to you. 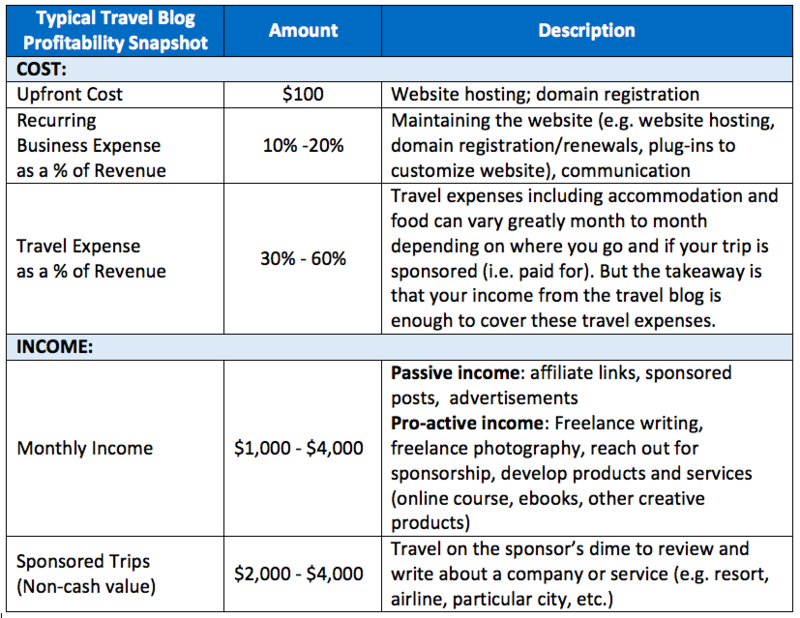 And if you aren’t a travel blogger but are a 9-5 employee feeling stuck, I hope you found this analysis helpful in making a decision in one way or another in regards to travel blogging. Would love to hear your thoughts as well.